Anyone walking into my sewing room knows I like to have choices. 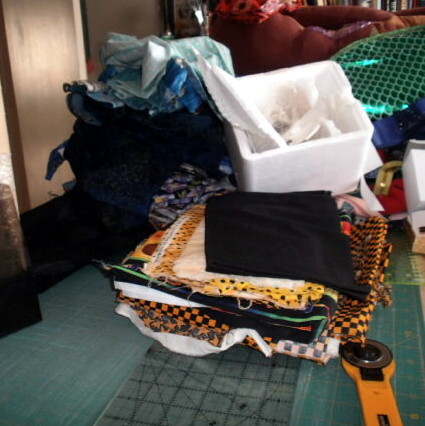 There are stacks of fabric everywhere, waiting to be chosen for the next project. Sometimes the stacks are organized, and sometimes they just exist. I used to feel guilty about this need to collect fabric, until I noticed all the other choice categories around the house. Some are mine alone, like the hand cream collection. Others are collective choices. The whole family loves tea, so I keep a variety in stock. What brought me joy, however, was recognizing I am not alone in my desire for choice. Only one person in the house eats breakfast cereal, and here’s the shelf where the cereal lives. It occurs to me that I will only be judged a hoarder by those who don’t appreciate what I collect. In the greater scheme of things, I am providing employment for those who make and sell the fabric that I love, I use my fabric (albeit slowly) for gifts and to make art, and I try to share when the opportunity arises. That makes for a balanced ledger in my mind. I cleared off another bit of shelf the other day. Imagine my surprise when I discovered one of my thread boxes also has a collection of thimbles. I bought most of these thimbles, in person, with my own money. You would think I would remember them. Not so. These are thimbles I remembered that I have. I inherited them from my grandmother. Some of them might be fifty years old or more. I’ll never know, because they arrived in a box after she died. I used to feel sad about that, the not knowing. Given that I’ve forgotten the history of my own thimbles, I’m going to stop feeling sad, and just be happy that I have them, and that connection with my grandmother. I happened to be in Tucson visiting friends during the Gem Show. We decided to go to one venue (there are venues all over the city). It was amazing and unsettling. For the the first time in my life, I experienced shiny object overload. There was so much to see that I stumbled around like one of the walking dead. And I didn’t buy one single thing. Yes, I know, astounding but true. There was so much to choose from I couldn’t choose. I saw the rocks with fossils and thought of the fish I bought my husband. I saw the rough stones and thought of the polished petrified wood we bought on a family trip. I saw all the beads and thought of my partially organized collection. After all that thinking, I added another item to my New Year project list. I will organize my beads with an eye to what is missing. That way, the next time I’m at a gem or bead show, I’ll know where I should look to round out my collection. For good measure, I’ll look at my other rocks and gems, just in case there is another collection in my future. Writers are familiar with the term “muddle in the middle.” It means the hash you’ve made of your story while you were getting from the grab-them-by-the-throat beginning to the eye-popping ending. This week, I created a visual for that phenomenon in my sewing room. I’ve made great progress organizing my two walls of shelves, but in the process I’ve pushed everything to the center of the room. This is a bad thing – not the Cuban Missile Crisis bad, but still not good. 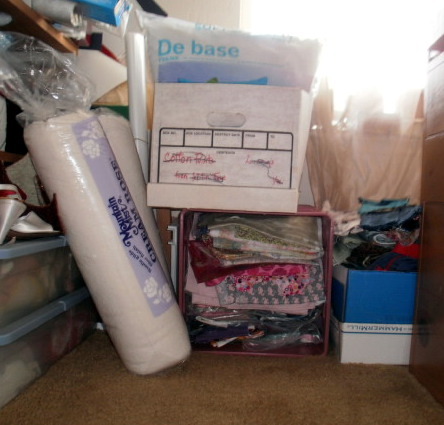 I have a project with a deadline, so I have to sort enough stuff to make space at the sewing machine to work on it. More important, I have to avoid the impulse to pile things up in front of my newly organized shelves. All of this happened because I was able to open up some space on the shelves pictured above. I decided to be sensible about filling the holes, and put all of the like things together. 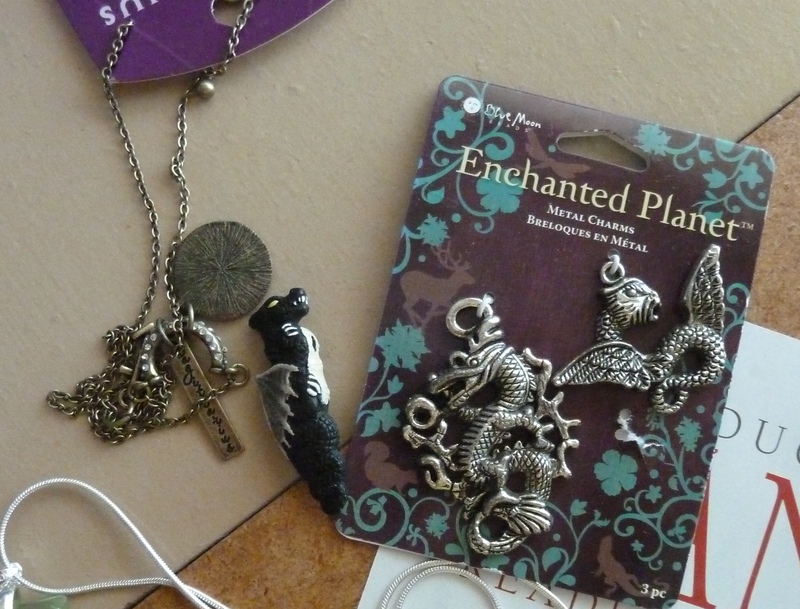 That’s when I discovered that the bead collection I thought I had consolidated somehow grew. A lot. It now takes up nearly an entire shelf all on its own. Even with the muddle in the middle, I consider my efforts a win. This is the most floor space I’ve had in ages. I’m not saying being able to vacuum the carpet will help my creativity, but it might cut down on the sneezing. Labels for people are rarely useful, unless you are planning a potluck. In that case, making sure you invite the people known for their signature dishes – The Fruit Salad Lady (my mom) and The Deviled Egg Lady (my friend Ann), for example – guarantees the rest of your guests are happy. Aside from that, save the labels for your boxes. It should go without saying that you should use the labels you save, but here’s the evidence that I don’t always follow my own advice. When I cleared away the piles in front of these bins, I realized I had no idea what was in them. Worse, I couldn’t remember when I had put those bins at the bottom of the stack (which I removed before I took this picture). Clearly, whenever it was I had already decided I didn’t need to get to the bins in a timely fashion. 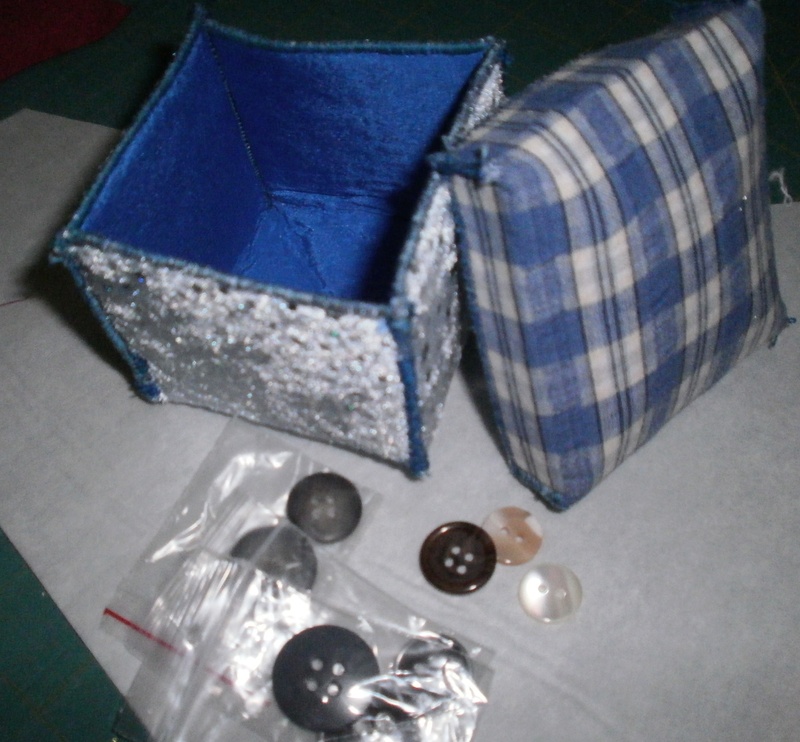 So, I bit the bullet, pulled out the bins and filled that hole with fabric that I hope to use in the near future. The bins held a pleasing variety of treasure and trash. 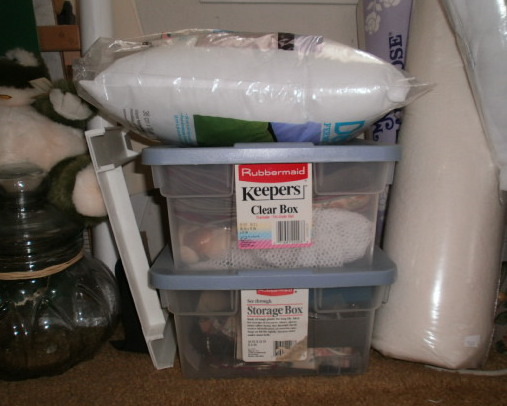 I’ve put the treasure in bins with like items and tossed most of the trash (well, you never know when you’re going to need something to embellish a trashy quilt). A side benefit of pulling out the bins was I managed to unearth some forgotten fabric collections. It is possible that I collected these black-and-gold fabrics for high school quilts for my kids. Given that my youngest graduated in 2005, I’m guessing I can use the fabric for something else. There were several other fabric collections that had outlived their project deadlines, but I’m certain I’ll find something to do with them. If all else fails, I’ve got stuff to make backs. I quilt, therefore I collect. That’s what I tell myself when I run across something that I can’t recall buying but must have because it’s in my studio. I probably won’t wear the penguin pin, but I want to keep it. It was given to me, after all, and gifts should be honored. I already have a frog quilt collection. 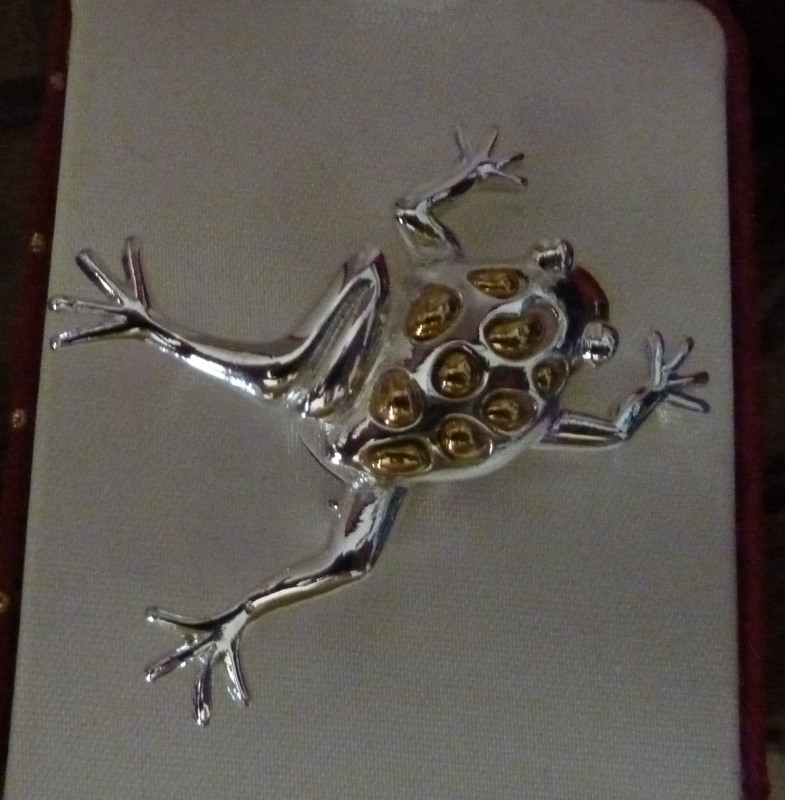 One more for the frog pin won’t be much of a stretch. Well, make it two – I still have plenty of frog fabric. 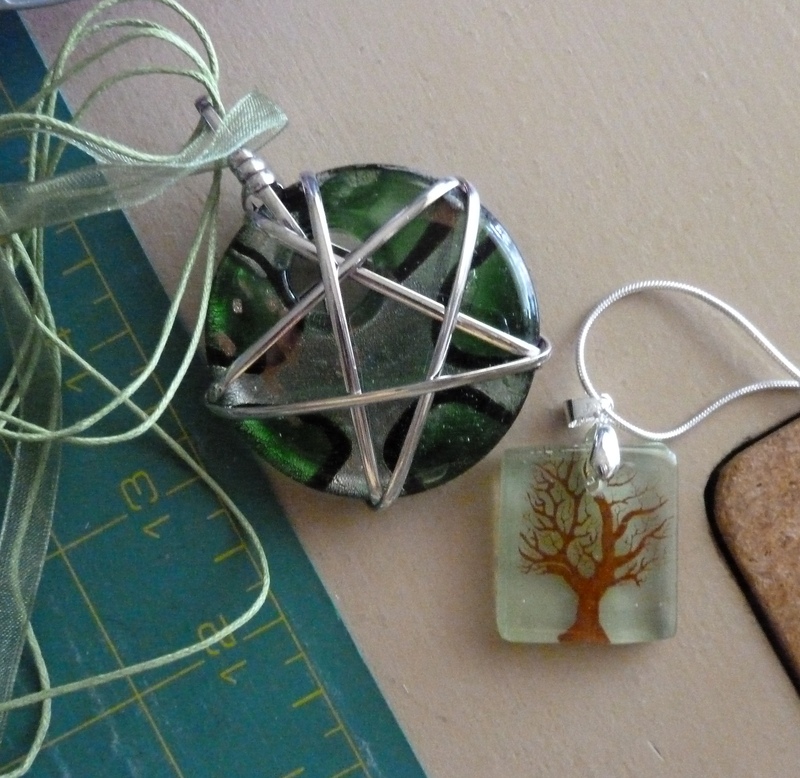 I have plenty of tree and Celtic-inspired fabric for these pendants. Yes, the pentagram is just as heavy as it looks, but with a little luck and some good stiffener I’ll come up with something. The dragons, like the penguin, will take more thought. I made one dragon quilt a long time ago, and one quilt with penguin fabric. I know there’s a design out there, somewhere, waiting for me to discover it. In the meantime, I will continue to quilt, and to collect. You buy a new sweater. It comes with extra buttons. You put them in a safe place. Time passes, you give the sweater away. You still have the buttons. Your favorite shirt is to too old to wear, but too soft to give away. 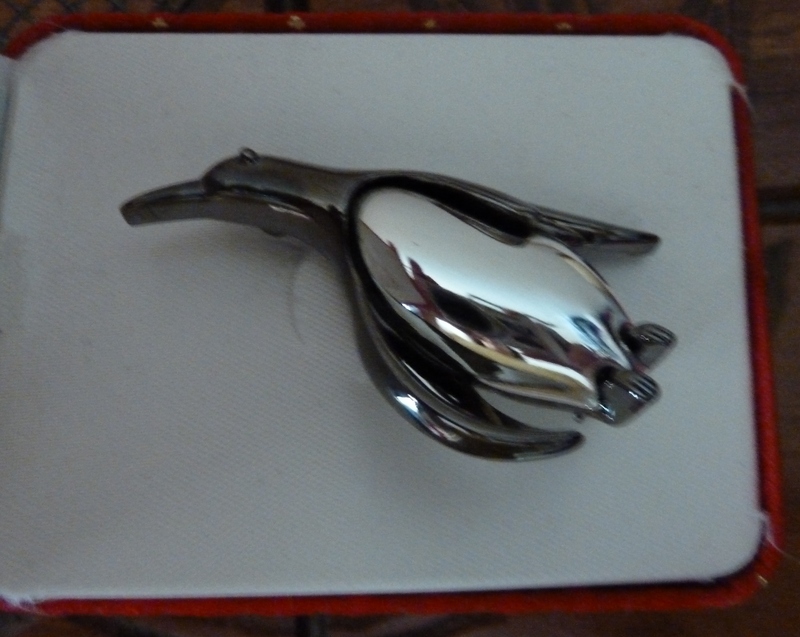 You use it to polish the silver, but first you cut off the buttons. Before you know it, you have a button collection. Sometimes you find a use for the buttons. Sometimes you find a place to hide them. Before you know it, the button collection has you. My button collection has me around the throat, but I’m fighting back. I have an idea for a series of quilts that will use a fair few of my buttons. With any luck, I’ll have something to show next week.